An excellent replacement for tune-o-matic bridges. My Saga PRS style kit guitar has been an ongoing DIY project for a while. Whilst it is a very cheap guitar made from cheap timber and components it funnily enough has quite a good tone. I’ve done a bit of DIY work to get to this stage. I’ve installed Mighty Mite Motherbuckers, and modified the bridge pickup with a half-aired ceramic magnet, as well as a 0.047uF capacitor for a bass cut. I’ve also upgraded the rubbish machine heads with a set of Gotoh standard machine heads to help with tuning stability. I installed a Suhr style blower switch to bypass the electronics on the bridge pickup, and installed an EVH Custom Low Friction Pot. The main issue now with the guitar is the cheap tune-o-matic bridge, and what I believe is a mismatched radius, and badly cut saddles that bind the string a bit when bending, throwing out the tuning of the treble strings especially. The intonation adjustment on the bridge wasn’t quite good enough to tune a guitar properly either. I’ve been looking at a few options to sort out the bridge, from buying new saddles and cutting the grooves to match the radius of the neck, to buying a whole new bridge with a (hopefully) matching radius. I decided that I didn’t want to try cutting saddles myself, and I wasn’t yet completely certain what the radius of the fretboard was. I discovered the Wilkinson Brass Roller Bridge with locking studs, and the specs of this bridge looked particularly appealing to me. I particularly liked the idea of having roller saddles, as it avoided any string binding when bending, and if I decided in the future to install a Bigsby the saddles would be handy for tuning stability. The 14” radius of the bridge was set in the baseplate, and the saddles are all the same size. I’m not 100 percent sure of the radius of the guitar’s fretboard, but I figured it was closer to 14”. The thing I liked about this bridge was that the saddles are attached to the baseplate much like a Floyd Rose tremolo bridge, meaning that if the bridge radius didn’t quite match the fretboard I could shim the saddles to better fit the fretboard. 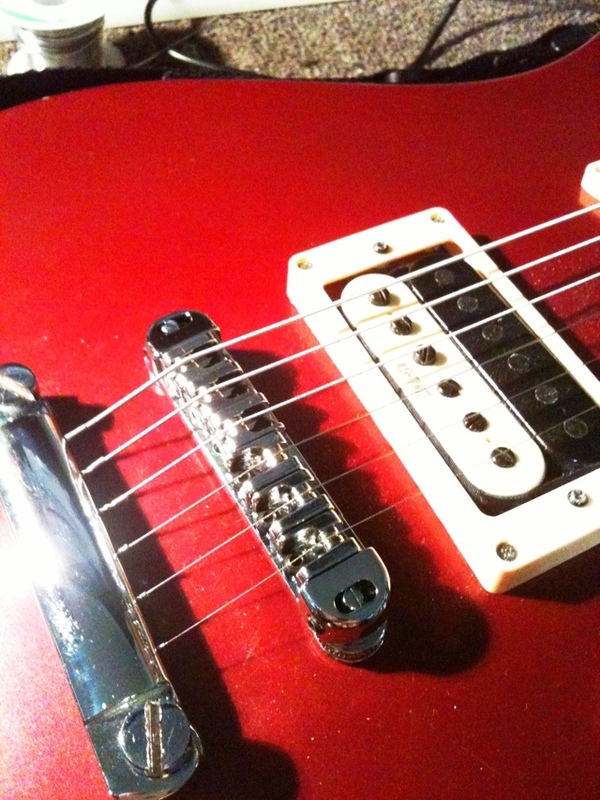 The other awesome feature is the ability to lock the bridge to the studs, which results in better stability and tone. The mounting holes in the bridge have two grub screws to lock the bridge in place, and there is enough wiggle room in the holes to make minute adjustments to the bridge position to fine-tune intonation if needed. The best part about the Wilkinson Brass Roller Saddle Bridge was the price. I was surprised at how cheap this bridge was considering the specifications. Wilkinson are known for making great guitar parts at reasonable prices so I jumped on the bridge. When the bridge arrived I gave it the once over, and it looked to be a nicely made piece of kit. Installing it was a breeze for the most part too. My stock bridge was an import spec piece, and thankfully the studs that came with the Wilkinson matched the diameter and thread of my installed anchors. The only problem I found was that one of the grub screws for locking the bridge to the stud was a bit stiff, probably due to a bit of a burr in the hole. I was able to tighten the screw and lock it down though. Adjusting the intonation was a breeze. As mentioned earlier the saddles on the Wilkinson bridge are mounted in a similar fashion to Floyd Rose type tremolo bridges, and whilst the Floyd Rose saddles are a pain to adjust the Wilkinson was nice and easy. With the roller saddles I could loosen the saddle bolt and shift it without loosening the tension on the string, and the saddle would hold where I wanted it to. If the saddle weren’t a roller type I doubt this would have been possible. The intonation range on the new Wilkinson bridge was far better than my stock unit too, so I was finally able to properly intonate a couple of strings that I just could not quite get right with the old bridge. With the bridge installed and the intonation set it was time to test out the guitar. The fit and finish of the Wilkinson bridge is nice and smooth, making it very comfortable on your picking hand. String bends in the higher registers was always a problem with the old bridge due to the incorrect bridge radius. The notes would choke out on the frets from about the 10th fret up on the B and high E strings especially. With the new Wilkinson bridge I am now able to bend these strings with minimal catching on the frets, and I have also been able to lower the action a little more too. The upgrade to the Wilkinson bridge has resulted in better tuning stability too. The smooth spinning motion of the rollers means that the strings can move freely on the saddles while performing string bends, not catching like they did on the old bridge. Locking the Wilkinson bridge to the studs seems to have given the guitar fuller, brighter tone as well. The integrity of the string vibrations are preserved when the bridge is fastened more solidly, so sustain has improved a little too. Overall the Wilkinson Brass Roller Bridge with Locking Studs is a fantastic cost effective upgrade for any tune-o-matic bridge equipped guitar. It’s extremely comfortable compared to traditional tune-o-matic designs, and the enhanced tone, sustain, and tuning stability is a welcome addition.